At Castelletto Suites there are four independent and completely remodeled apartments. A particular attention to keep the outstanding beauty of the architectural elements of this historical Palazzo was paid during renovations. Details such as old bricks and chestnut and juniper ceiling beams were restructured carefully in their original way . Modern comfort and antique simplicity form an unusual ambience and original paintings with sardinian motives of a famous painter from Cagliari, highlight the love for the details in each individual room. 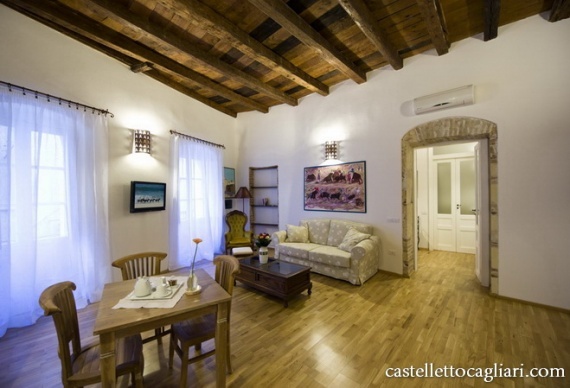 Each apartment at Castelletto has a large living room, with a kitchen line and a sleeping sofa, while the large bedrooms with king size beds, give the possibility to add a bed for a third guest. Every room has a large bathroom with shower and all necessary comforts. The property is an ideal solution for families or for those who come to Cagliari for business and for long periods of time, as they may need larger spaces. The structure was conceived to ensure a maximum of independence and freedom to our guests during their vacation without having to renounce to comfort. The concept reflects the spirit and the nature of the historical city with its singular Sardinian ambience that our guests will experience daily during their journey. The city center, the pedestrian area and the shopping center are easily reachable within walking distance as well as the public transportation, located just few blocks away.